Ultimate. The ultimate evolution of the R-SYS unveiled in 2007 (HERE). It looks like Mavic likes the Giro for testing its newest products. It was already the case with the R-SYS used by one of the leader in 2007. This year, Liquigas, Silence-Lotto and AG2R will have the chance to try these new toys before anyone. 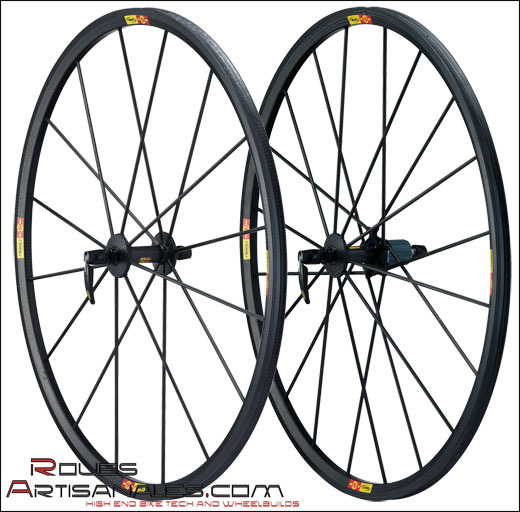 The wheelset is supposed to weight only 950g. Carbon fibre is used on every component. A special 22mm shallow rim weighting in only 230g (!) is developped for this wheel. 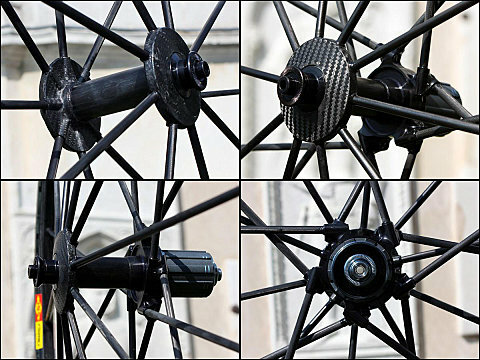 inertia seem to be the strong points of this new wheelset which we hope to be available the next year. This new R-SYS Ultimate is designed for mountain where it should provide its best. It should however suffer of the same aerodynamic properties as the current R-SYS or R-SYS Premium. The long straight and fast roads won’t be its cup of tea for sure. For high speed, the CCU will help you reach high speed. For mountain stages, the R-SYS Ultimate will hep you reach the summit with lightness. These two high end wheels may also benefit of using only one of the two wheel as front or rear, to get the best of the two. (CCU front for aero, R-SYS rear for lightness). 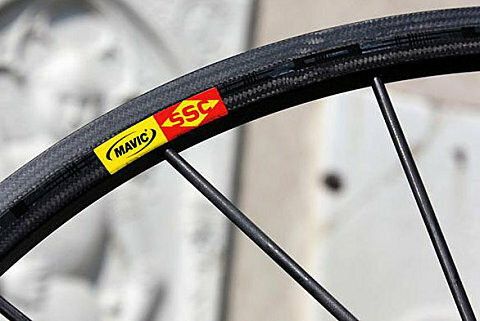 Mavic is going to have a superb high range offer for 2010, if the product is realeased the next year. 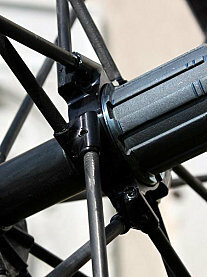 From a technical point of view, the tubular carbon fibre spokes are bonded inside the hubs and inside the rims. Like the current CCU, the repairs certainly won’t be possible and the MP3 programm will be highly advised. inside the hubs and inside the rims. This is very different from the technology used to make the Cosmic Carbone Ultimate: its spokes are molded in the rims and wrapped around the hubs. their X1000 wheels we will unveil very soon. Mavic has been criticized during a long period for its inaction after the Ksyrium release, which was made profitable for more than 8 years (! ), fortunately they are going forward since two years. We like it, we are waiting for the next instalment.